heather & olive: sleepy tea. When it comes to sleep, I think I've finally figured out that I need at least 8 hours--less than that or more than 9 I'm groggy and a mess. (I will never, ever be someone who can hop out of bed after sleeping 4 hours and function). But recently I found that I was having issues falling asleep--even when I stayed up past my usual bedtime of 10:00. Stress was definitely a factor and I knew I needed to do something, so I tried taking melatonin pills and they did absolutely nothing. I really didn't want to go down the road of taking other conventional sleep aids because I'm a wimp and I was scared I'd never be able to fall asleep without them (see also: sleep eating). 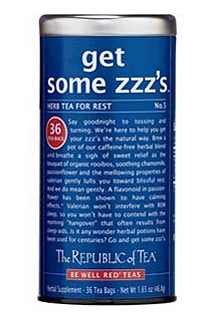 On a whim, while at my favorite local grocery store I picked up The Republic of Tea's get some zzz's tea, and while I've never been a big tea drinker, it's safe to say I'm a convert. I don't drink it every night, but on the nights when I'm having trouble unwinding it's been super helpful (and I don't know if it's the actual tea that's doing it or my mind being tricked into being tired since I know I'm drinking something that is supposed to make me sleepy, but regardless, it's been a lifesaver). A couple of sips is all it takes and I feel infinitely more relaxed. I'm curious--are there any other tea converts out there? Are there brands I should try? I used to occasionally drink peppermint or chamomile tea before bed. I am usually drawn to the Yogi teas. So, not tea, but I am big fan of using magnesium... I like the Natural Vitality Natural Calm in Lemon. At first the taste took a minute to get used to, but I like it now. It really helps. Love it. It sometimes makes me have to get up and pee at 2am but still worth it.